We don’t have a working TV in our apartment so I tend to be a wee bit behind when it comes to TV shows. 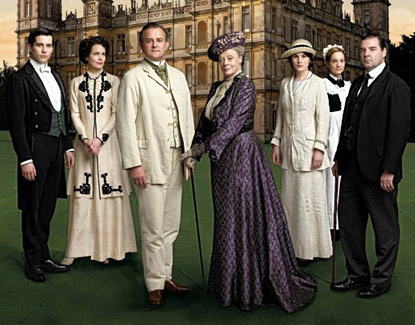 I’m what you might call a laggard in that regard, and hence I’ve only *just* got bitten by Downton Abbey fever. It’s Author Lauren Clark’s fault :) I’d heard the hype about the show from several places, but it wasn’t until Lauren told me that “even her husband loved it”, and I just had to watch it that I was sold. She even sent me the link to stream it from Hulu which just about sealed the deal. And now I’m hooked. – “How the other half live” – Sort of like an older version of The Kardashians, I find myself wondering what it would be like to have my meals cooked for me, my hair curled by a maid, to be dressed each evening for dinner and to not know how to make a cup of tea! – Dry humor to balance even the most serious of plot-lines – Grandma Violet cracks me up with her snide jokes and witty come backs! What did I miss? What makes the story so gripping for you (or, what is it lacking?) Leave your thought in the comments!